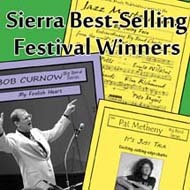 Festival 3-Chart Program - "Sierra Best-Selling Festival Winners"
Wildly popular, these 3 charts represent some of the best-selling music Sierra Music has to offer. In this festival set, we have put together a great, diverse, energetic program which is sure to bring your audiences to their feet and inspire your band to play their hearts out. Made famous by the Buddy Rich Band, this medium-up swing chart is "Big Band Swing" at its best! There is plenty of solo space for alto, piano, and trumpet. It also features a terrific saxophone section soli. This was played by Buddy's band a lot and will surely get your audience to pay attention right out of the gate.